This book is a comprehensive, contemporary examination of a single psychiatric illness, delirium, which has significant implications for all areas of medical practice. 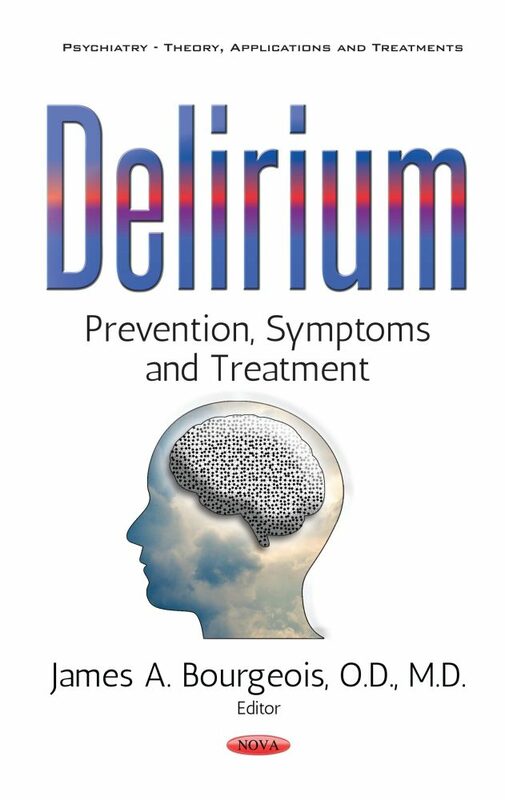 Given the increasing age of the population as well as the associated increased risk of a major neurocognitive disorder (formerly dementia), which is the major risk factor for delirium, such a book on the complexities of delirium is timely and needed; there is currently no clinical guidebook for the assessment and management of delirium. Delirium is seen in all medical settings, though the risk is higher in the ICU, medical/surgical wards, and the emergency department. Less commonly, delirium is seen in primary care and in the community, but those places are in need of delirium awareness, surveillance, and prevention. The authors take various approaches to the problem of delirium. This book includes the following chapters, Delirium Overview: The Classification, Diagnosis, Prevention, and Intervention in the Intensive Care Unit, Hospital Ward and Primary Care Settings, Initial Evaluation and Interview of the Delirious Patient, Preventive and Early Intervention Strategies for Delirium among Critically Ill Patients, Prevention of Delirium in the Medical Wards, Hypoactive Delirium in the Critical Care Setting, Postoperative Delirium, and Delirium Outcomes: A Look at Mortality, Persistent Delirium, Medical Complications and Cognition, to approach delirium in adult patients concerning several illnesses and care settings. Specific to this book are several chapters devoted to special topics in delirium: Pediatric Delirium, Psychiatric Disorders, Treatments, and Their Association with Delirium, Delirium Associated with Alcohol Use, Neuropsychological Assessment of Delirium in Older Adults, The Role of the Pharmacist in the Assessment and Management of Medication Induced Delirium, and Delirium and Legal Issues. These are areas often not emphasized in delirium management. "Delirium is unquestionably one of the most important psychiatric illnesses in those who have general medical illness, as it frequently results in a substantially increased risk of morbidity and mortality, if not prevented or treated early and effectively. Delirium is also unique in that it is both a "psychiatric" and general medical illness, which requires vigilance and routine partnering with other treatment partners in order to optimally manage. Bourgeois and colleagues have done a masterful job with defining and presenting a practical and balanced approach to the prevention and treatment of delirium. It is also helpful to read their detailed evidence-based treatment plans for the most common causes of delirium (e.g. alcohol related, medication induced). I encourage all psychiatrists and other providers to read this text and use as a valuable clinical resource. Furthermore, this text should be required reading for medical students; psychiatry residents; psychosomatic fellows; internal medicine residents; family medicine residents; physician assistant students; nurse practitioner students; emergency medicine residents and neurology residents. I appreciate this important clinically relevant addition to the medical literature and strongly recommend it for medical providers." Audience: Various specialties in medicine (especially medical students and residents/fellows, nursing, the mental health disciplines of clinical psychology and social work, pharmacy, health care administrators. General public members who have an interest in delirium.